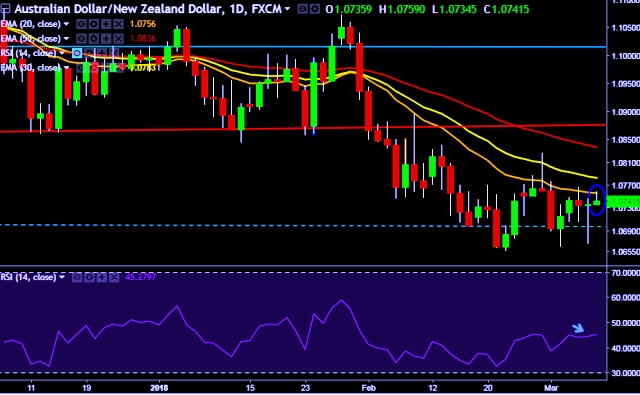 AUD/NZD is currently trading around 1.0741 marks. Pair made intraday high at 1.0759 and low at 1.0734 marks. Intraday bias remains slightly bullish till the time pair holds key support at 1.0692 mark. A sustained close above 1.0735 will drag the parity higher towards key resistances at 1.0826/1.0945/1.1072/1.1113/1.1163/1.1238 levels respectively. Alternatively, a daily close below 1.0692 will take the parity down towards key supports around 1.0654/1.0550/1.0443 marks respectively. Australia Jan trade balance G&S (A$) increase to 1055 mln au (forecast 300 mln au) vs previous -1358 mln au. Australia Jan goods/services imports decrease to -2 % vs previous 6 %. Australia Jan goods/services exports increase to 4 % vs previous 2 %. Australia's S&P/ASX 200 index up 0.38 pct at 5,924.20 points in early trade.